Enjoy beautiful scenery, lighthouse and museum, hiking trails to the high cliffs, art galleries, quaint village, and whale and seal sightings. Let the cool ocean breezes set your course on this relaxing one and one half hour sail on the Bay Lady. See lots of activity and scenery on this narrated one-hour cruise aboard the Novelty, the Squirrel Island mailboat. Enjoy a living history tour of the Burnt Island lighthouse as it was in the 1950s. 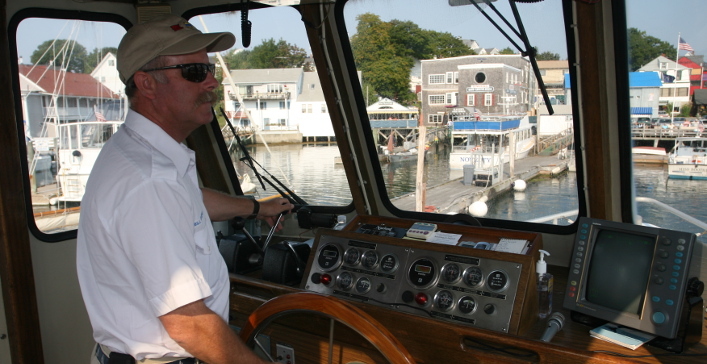 You’ll catch lots of fish on this 2 -hour trip on the Miss Boothbay. Great for families. and reserve your favorite experience. Get away from it all and experience a Monhegan Day Trip with Balmy Days Cruises! Monhegan Island is a unique and beautiful island 12 miles off the coast of Maine. Renowned for its striking natural beauty, Monhegan Island attracts artists and nature lovers from around the world. Visitors are captivated by Monhegan’s breathtaking scenery, bucolic setting, migrating birds and spectacular ocean views. Explore Monhegan Island’s 17 miles of hiking trails, browse artist galleries and shops, enjoy a leisurely lunch at one of Monhegan’s cafes and visit the Monhegan Brewing Company for fine craft ale. Take a day trip, or stay overnight at one of the islands many comfortable accommodations. Our vessel, the Balmy Days II, is a twin-screw, motion-stabilized 65-foot fiberglass boat, built on an offshore fishing hull custom-outfitted especially for the Monhegan trip. This is a passenger only trip (no vehicles) departing Pier 8 in Boothbay Harbor at 9:30am and arriving back at Pier 8 at 4:15pm. The boat ride is 1-1/2 hours each way which gives you about 3-3/4 hours on the Island. Each leg of the trip is booked separately. At 2:00pm we offer a trip around the Island (weather permitting). This ½ hour ride circumnavigates Monhegan giving you a spectacular view of the cliffs on the backside from the water, occasional whale sightings, and often times seals are found on the Duck Rocks. The Balmy Days II is available for private charters from Boothbay Harbor after 5:00pm. 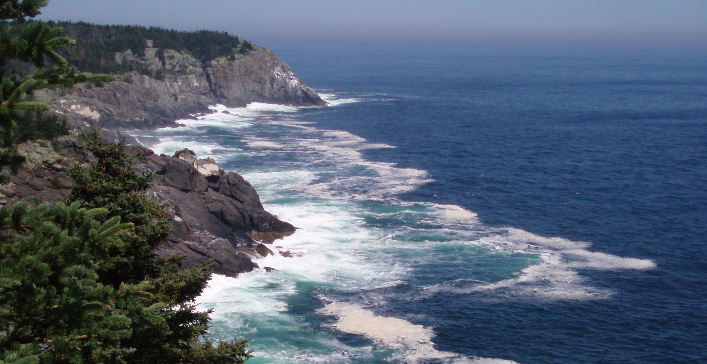 Monhegan Island, 12 miles out to sea, is unique among places to visit in Maine. Having successfully resisted modern development, this small island, just 3/4 mile wide and 1-1/2 miles long, is a haven for those seeking beauty, quiet, and relaxation. Monhegan is year-round home to fewer than 65 residents, many of them fishing families. The island has no paved roads and no cars, but its walking trails offer commanding views of the Atlantic Ocean from the highest cliffs in Maine. Monhegan Island attracts visitors from all over the world who want to paint or photograph the rugged, coastal scenery; see migrating birds, rare wildflowers, and sea life (whales and seals); or who just want to escape for a few hours or days from their busy lives. Starting Memorial Day Weekend running through Columbus Day Weekend. DAILY RUNS early June til late September/early October. Optional “Trip Around the Island” departs Monhegan Wharf at 2:00 pm. ½ hr trip (weather permitting) $5.00 each, collected on the trip. For more information, visit www.welcomemonhegan.com, or click here to view a map of Monhegan Island. Sail near many scenic islands of Boothbay Harbor, Burnt Island Lighthouse, Southport Island, Capitol Island, Mouse Island, Ram Island Light on this 1-1/2 hour trip. Enjoy the fresh sea breeze as it determines your course. Your experience will be unforgettable as you indulge your senses in quiet enjoyment of the ocean’s beauty and the wind’s power. An occasional Northwest gust adds excitement; and occasional becalming occurs when the winds shift direction. Your Captain will provide you with interesting bits of information as you pass by coves, other watercraft, and lighthouses. The Friendship Sloop, The Bay Lady, is a unique type of sailing craft and holds a proud position on the Maine Coast as once being the “work” boat of Maine lobstermen. Now, the boats are primarily used for pleasure. Each year the Friendship Sloop Society holds a reunion highlighted by races. The Friendship Sloop is recognizable by its large gaff rig mainsail and long bowsprit. The Bay Lady is also available for private charters at the time of your choice or book a trip on the schedule just for your group of up to 12 guests. Call to schedule your own trip. Daily mid to late June running until mid September. 1-1/2 hour trips. BOOK YOUR SAILING EXPERIENCE NOW! Nightlights: lighthouses flashing their beacons to ship at sea, starlight or moonbeams forming mysterious paths across the sea, village lights reflected in the calm harbor waters. Please note: There are no automobiles or bicycles permitted on Squirrel Island. The NOVELTY is available for private charters. The Novelty (Squirrel Island Mail Boat) departs several times daily from Pier 8, following a full schedule in July & August, and an off-season (less frequent) schedule March-June and September-November. BOOK YOUR HARBOR EXPERIENCE NOW! There are lots of mackerel to be caught in the waters near Boothbay Harbor. The Miss Boothbay will find several fishing spots and help you reel in the fish. Tackle provided. The fish are plentiful, the scenery is spectacular, and the company is fun on this 2-hour boat trip. Experience the harbor’s beauty while having fun. All Tackle is provided. Daily mid to late June running until mid September. 2 hour trips. 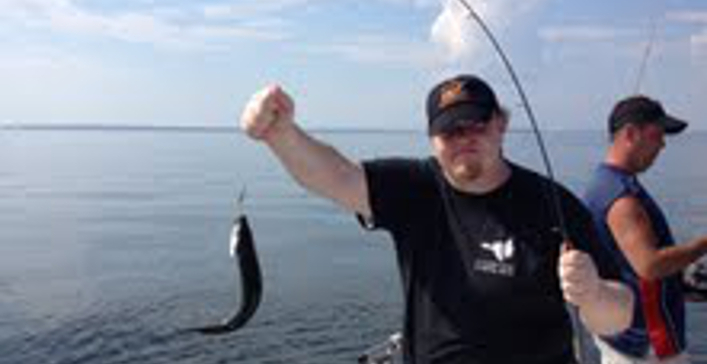 BOOK YOUR FISHING EXPERIENCE NOW! Enjoy a lighthouse tour of Burnt Island where keeper Joseph Muise and his family will acquaint you with lighthouse living as it was in the 1950’s. Visit their home and climb the spiral staircase into the lantern room. Learn about Maine’s fisheries, flora and fauna on your picturesque hike around the 5-acre island. Enjoy 2-1/2 hours on Burnt Island and a scenic 15 minute boat ride each way. You can find MUCH MORE information about Burnt Island Light programs on the Maine Department of Marine Resources web site. Lighthouse Tours via the Novelty are available on Mondays and Thursdays only from Early July through late August. BOOK YOUR LIGHTHOUSE EXPERIENCE NOW! Balmy Days II– The Balmy Days II was built in Arundel, Maine by DMR Yachts in 1988. She is a twin screw, 65-foot fiberglass vessel with a custom designed superstructure on a seaworthy off-shore fishing hull. Stabilizers were installed to ease the motion on offshore trips. She was built especially for the trip to Monhegan Island. She can carry 130 passengers. Novelty: The Squirrel Island Mailboat– The Novelty hull was built by MDI Boat Works in Southwest Harbor in 1996. Engines, steering, and other mechanical work, was completed by the Jim Rich Boat Yard in Tremont, ME. Trailered to E. Boothbay, she was finished by ship builder John Luke and Capt. Bill Campbell. The Novelty is a 47-foot fiberglass vessel, built especially for carrying passengers. Her license is for 79 passengers. Bay Lady: A Friendship Sloop– The Bay Lady is a 31-foot Maine built Newman/Lanning fiberglass Friendship Sloop, and the longest continuously operating sailing excursion in Boothbay Harbor. She was launched in 1979 and has been carrying passengers for sight-seeing sailing trips since then. 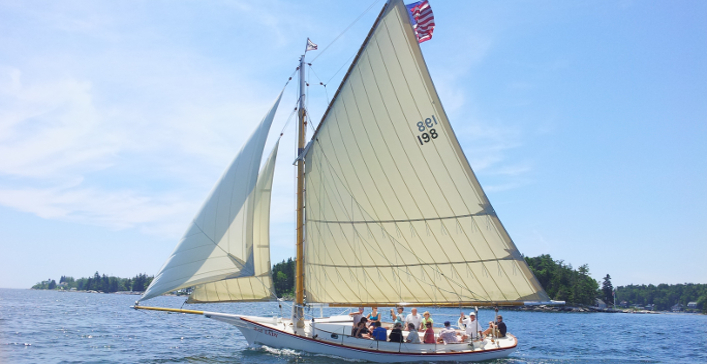 She carries up to 12 passengers and is perfect for a sailing trip around Boothbay Harbor. Miss Boothbay– The Miss Boothbay, built by Young Brothers, is a 33foot lobsterboat hull. She’ll carry up to 16 passengers fishing and 20 passengers for sightseeing. She is popular for wedding transportation, small group charters, sightseeing, and mackerel fishing. has been navigating the waters off Boothbay Harbor for over 40 years. His first job as a deck hand was on the Squirrel Island Ferry, Maranbo II with Captain Bob Fish and then on the deep sea fishing boats. Bill acquired his captain’s license at the age of 20 and ran the Squirrel Ferry for Capt. Fish for two seasons. In 1981, Capt.Bill & his father, Capt. Bob Campbell, teamed up after purchasing the Maranbo II & the Balmy Days from Captain Fish. In 1988 the Campbell Captains supervised the building of the Balmy Days II to replace the aging wooden boat, and in 1996 Captain Bill took full charge of building the Novelty in order to replace the Maranbo II. Captain Bill’s love for the ocean expanded to sailing with the purchase of the Friendship Sloop, Bay Lady, and to fishing with the Miss Boothbay. In his father’s tradition, he carries on the operation of the family business. All boats hold a current USCG Certificate of Inspection. Be sure to stop in at our ticket booth at Pier 8 and check in with the booth crew to pick up boarding passes or just to see what’s happening. We offer a variety of boat trips for this event including sailing trips, a special trip for photographers, sightseeing trips, and a boat trip joining the Lighted Boat Parade. Book online now! Go to www.windjammerdays.org for other information about Windjammer Days in Boothbay Harbor. Book now! Tuesday, 6/25/19, 4:30pm – Special 2 hour sail to see Windjammers at anchor in Linekin Bay. Book now! Wednesday, 6/26/19, 12pm – Special 1-1/2 hour trip sailing with the Windjammers as they enter the Harbor. Book now! Daily sailing trips on BAY LADY. Book now! Wednesday, 6/26/19, 12:15pm – Special 1/3/4 hour trip by photographer Michael Leonard meeting the Windjammers as they sail into the Harbor. Book now! Wednesday, 6/27/19, 12:00pm – Special 1-1/2 hour trip meeting the Windjammers as they sail into the Harbor. Book now! Wednesday, 6/27/19, 1:45pm – Special 45 minute trip around the harbor to see the Windjammers at anchor. Book now! Daily one hour Harbor tours on the NOVELTY. Book now! This is a 2 hour trip at 6:00am on the BALMY DAYS II will take you around the Boothbay Region to view at least 4 lighthouses in the early morning light. Also take in the beautiful shoreline scenes and wildlife of the area. Host, photographer Michael Leonard, will be on hand offering tips and advice for your photography adventure. Climb up into the light towers, check out the museums in the old lightkeeper’s houses. 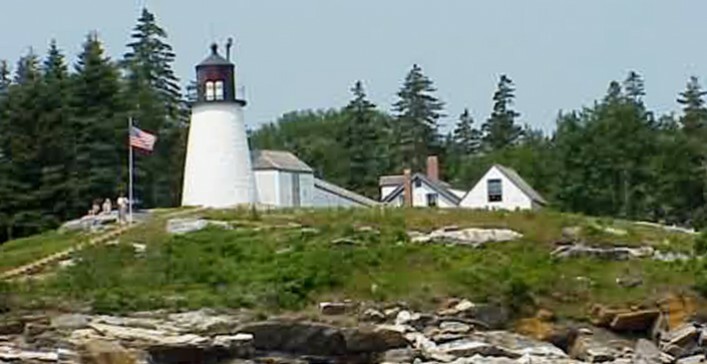 For information on all the lighthouses participating in Maine Open Lighthouse Day go to American Lighthouse Foundation. Book now! This is an all day trip to Monhegan Island leaving at 9:30am and arriving back in Boothbay Harbor at 4:15pm. You will be on the Island for approximately 3-1/2 hours. Be sure to book both your OUTBOUND and RETURN trips. The museum in the lightkeeper’s house and light tower will be open to the public. Also enjoy the rest of the island with its hiking trails, lunch places, art galleries and studios and quaint gift shops. Book now! From 9:00am until 11:00am there will be a 15 minute water taxi ride departing Pier 8 every half hour. Spend an hour or so on the island, climb the light tower, visit the lightkeeper’s house. Be sure to reserve your return ride time when you pick up your tickets. Return times are at 10:15, 10:45, 11:15, 11:45, 12:15. All four boats are available for private parties or transports. Popular for weddings. Trips can depart from Pier 8 or we can pick you up or drop you off at the location of your choice. Call with your thoughts and we’ll customize your trip. Caterers are welcome. Balmy Days II-Available after 5pm during the high season, any time off-season. 130 passengers max. 80 is comfortably crowded. Beer, wine, soft drinks, bottled water, coffee, and hot chocolate are available for sale. Novelty-Call for availability as she has scheduled trips to work around. 75 passengers max. She works well with 20-50. Beer, wine, soft drinks, and bottled water are available for sale. Bay Lady-Reserve a scheduled sailing trip for just your group or by the hour for the times of your choice. Miss Boothbay- Available for fishing, sightseeing, or water taxi service. Reserve a scheduled trip for just your group or by the hour for the times of your choice. Contact us by email with any questions or further information.